Guess in which houses several characters and their animals live based on the clues given on puzzle maps. Place the character and animal figurines in the appropriate houses, then check if you have aimed just by turning the card over to look at the solution. Children and beginner players start by placing their characters and animals in 3 houses before moving on to 5 houses. Learn to master the pictograms that will help you solve the puzzles and then become the king of logic! 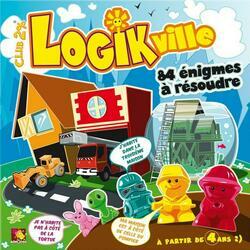 LogikVille, an exceptional experience that invites young and old to work on their neurons! Contents of the box : 5 plastic houses, 10 figurines (5 characters and 5 animals), 84 puzzle cards, 1 game rule.